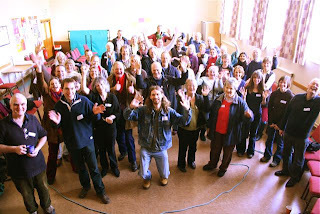 Many of you will remember the first two gatherings of Transitioners from all around East Anglia, at Downham Market and at Diss. I found them really excellent events, and heard the same from many others who were there. They gave me a strong sense that there were many others like me, with similar projects and similar difficulties. Sharing those gave me a renewed sense of purpose, lots of good ideas, and, especially, new friends. They were well worth the travel effort. I hope you will spread the word and come with a group from your initiative. The third gathering will be on 26th November, hosted by Transition Stour Valley and held at Old Hall Community, East Bergholt from 9 am (for a 10 am start) - 5 pm with optional food and evening entertainment for those wishing to stay on. The venue itself is an inspiring place, a large community that has been running for about 40 years on very environmentally sound and democratic lines. A tour of Old Hall is an option as part of the programme. The programme is designed to help you to meet those Transitioners from around the region who are most likely to be of interest to you, with mapping exercises, discussions, and 'organised but informal networking'. There will also be fun creative activities for children and a children’s Book and Toy swap, so bring along any you would like to swap. Getting there: Old Hall Community, East Bergholt, CO7 6TG. Buses run from Manningtree station and will stop outside Old Hall if you ask the driver at 09.40 (96), 11.40 (96) and 13.40 (96), its also a beautiful 3 mile walk on footpaths. Evening lifts can be arranged back to the station. There are also buses from Ipswich and Colchester to East Bergholt. Contacts: Miriam 07904198649 or Dave 07799338733 and further info and full programme .